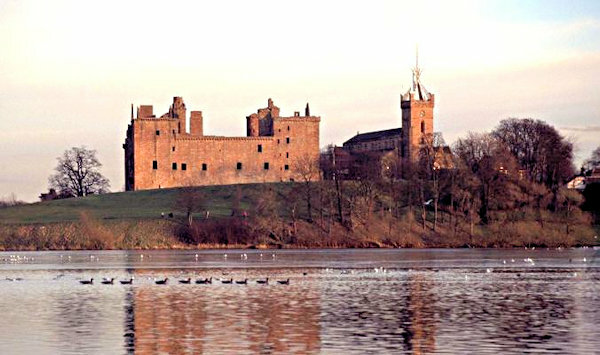 Overlooking the picturesque Linlithgow Loch, the large red-stoned ruined palace, which was the birthplace of both James V and Mary Queen of Scots, is an impressive and evocative place to visit. 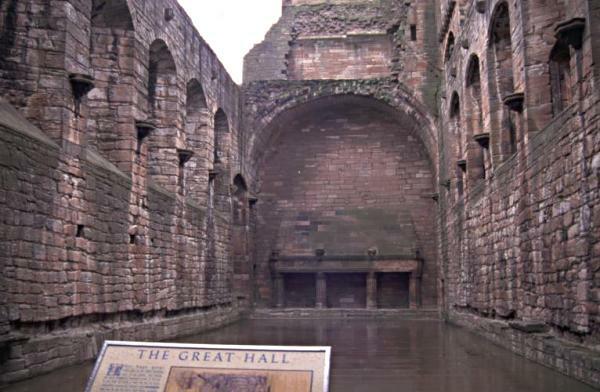 The oldest parts that still remain were built by James I in 1425 who spent over 4500 pounds on it, although the Peel of Edward I was originally incorporated in it. There is an ornately carved fountain dating from the 1530s in the courtyard of the palace which is remarkable for the fact that it was carved by a one-armed mason. 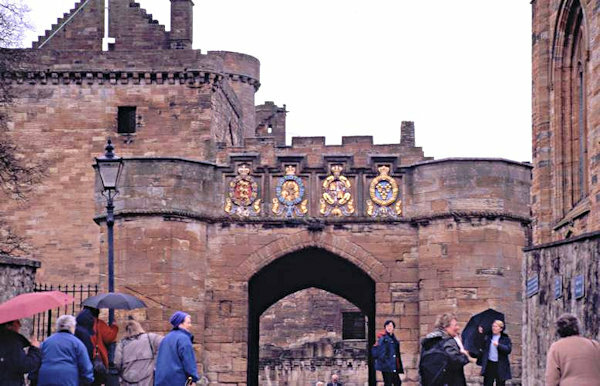 Linlithgow was strongly associated with the historical Anselm Adorne, who was made Keeper of the Palace in 1477. Dorothy uses the palace for James III and his court pilfering of Nicholas' wine and goods here in Unicorn Hunt before the "Salt Pans" incident. Adorne's meeting with the Queen's advisors takes place here in Gemini. St Michael's church dates from the 15th century - the current metal spire was erected in 1964 and replaced an earlier delicate stone spire of a very open design. Adorne is buried here, although it isn't known exactly where, and there is a plaque inside the church which commemorates him. A recent feature is the first public statue of Mary Queen of Scots which stands in the grounds of the palace. Situated to protect the bay which acted as Linlithgow's port, it was built by Sir George Crichton in 1440 but later given to the Crown. This was where Nicholas' ship unloaded the goods mentioned above and from where he left after Lucia's death. It was later under Adorne's control and was attacked by the English fleet in Gemini. The castle has had a rich history and was garrisoned until 1920 when it was opened to the public. 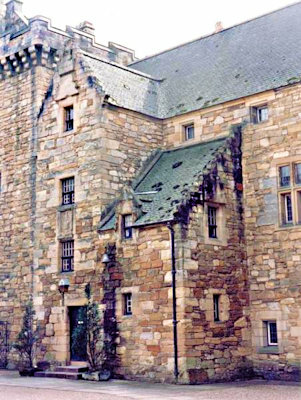 For many years this was the headquarters of the Knights of St. John in Scotland. It was granted a charter by David I in 1153. 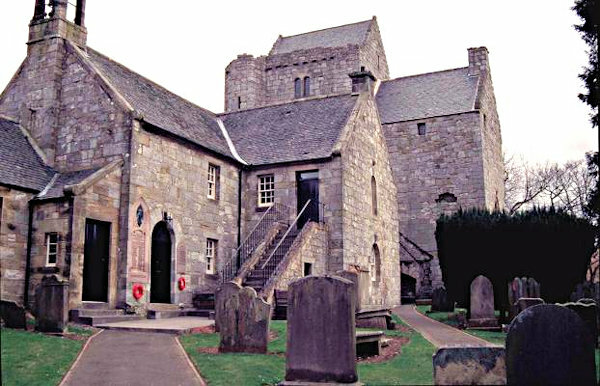 William Wallace stayed at Torphichen before the battle of Falkirk in 1298. After the Knights were forced out of Jerusalem and set up headquarters on Rhodes it was the rule that to be preceptor you had to spend 3 years on Rhodes. After the suppression of the Knights Templar in 1309 their property passed to the Knights Hospitallers. Sir William Knollis became preceptor in 1466 despite not following the above rule. He later became James III's Treasurer and took the title Lord of Saint Johns. The Knights were disbanded in the Protestant Reformation of 1560. 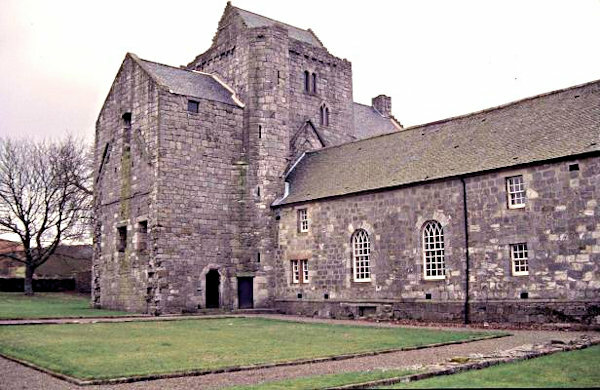 However Sir James Sandilands, the last preceptor, acquired the forfeited estates as a temporal barony with the hereditary title of Lord Torphichen. The Order was reconstituted in England in 1831 but not in Scotland until 1947. 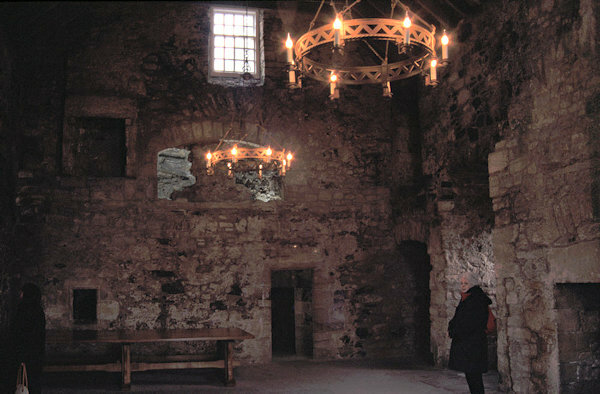 Although extended and reconstructed over the years, some parts of the Preceptory, such as the vaulted tower, date to the 13th century. A tranquil setting just to the south of the highland line with the "only lake in Scotland" on which is situated the island of Inchmahome with its priory, where the child Mary and her mother retreated during the English advance. Here Lymond meets the young Mary (who sits on his chest and tells him he has "insufficient of tonsure") and later Christian Stewart following his recovery from amnesia. Originally called Loch Winnoch after Saint Winnoc. The village retains that name and was once a bleaching and weaving centre. 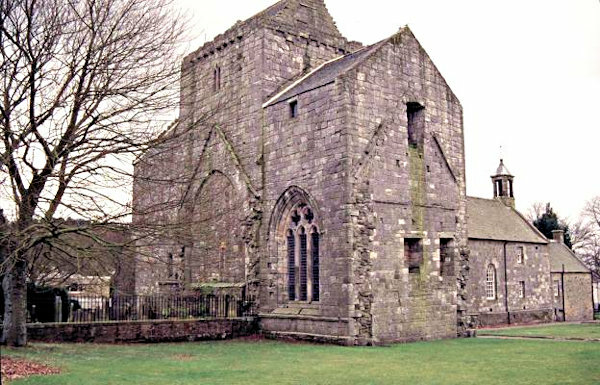 The belfry of St Winnoc's Church, is also known as Auld Simon! On the north side of the loch is the site of the former Castle Semple, and nearby the roofless but otherwise remarkably intact Castle Semple Collegiate Church which was built in 1504 but then mostly abandoned after the Reformation of 1560. The Semple family (whose name is spelled many different ways!) 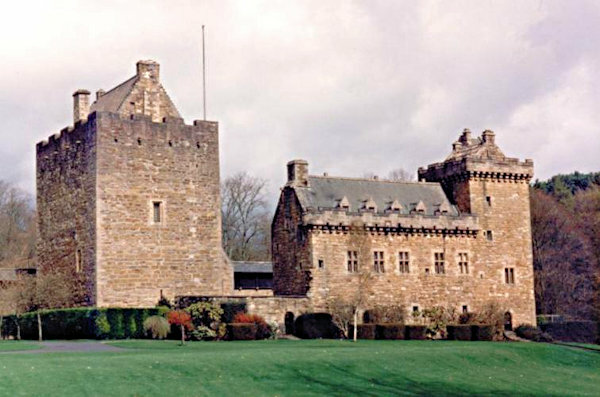 had owned estates in the area from as early as the 1300s and built the castle in the 15th century. The estate was sold in 1727 and the castle demolished to make way for Castle Semple House. That burned down in 1935 and what remained was later demolished. Beltrees lies on the south side of the loch where Newtown of Beltrees, an 18th century village is all that remains. The Semple family seem to have been poets and scholarly people. John Sempill married Mary Livingstone - one of Queen Mary's four Marys. 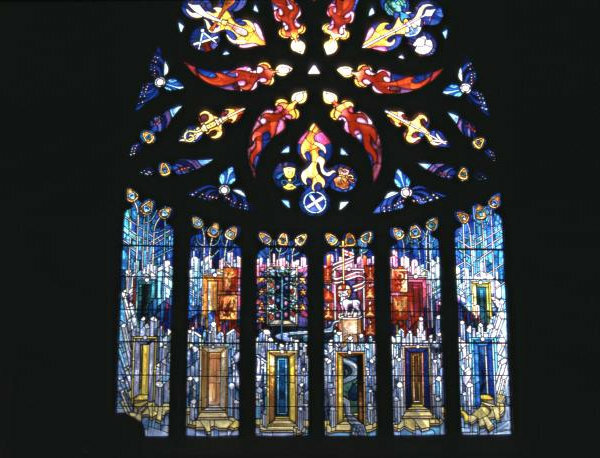 His son, Sir James Sempill transcribed King James VI's Basilicon Doran manuscript, and his son Robert wrote "The Life and Death of Habbie Simpson - the Famous Piper of Kilbarchan" in a poetic form that influenced Robert Burns. Francis Sempill of Beltrees who lived from around 1616 to 1685, wrote a book of poetry and songs including the well-known song Maggie Lauder. 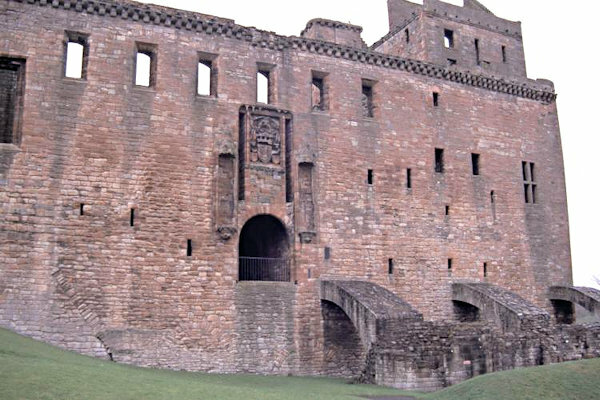 Home of the Boyds who were Lords of Kilmarnock. The castle is currently undergoing major repair and refurbishment work and will be closed until 2021. Once reopened it will house their extensive collections of early musical instruments, arms and armour and tapestries . From where the young Queen Mary set sail for France and Lymond encountered Joleta. The fortifications on Dumbarton Rock have a very long history, going back around 1500 years. Originally called Alt Clut (‘Rock of the Clyde’) it later became know as Dun Breatann (‘Fortress of the Britons’) - from which the name Dumbarton is derived - it was the centre of the ancient Kingdom of Strathclyde. It was besieged in 870 by Viking kings Olaf and Ivar of Dublin for four months, eventually falling when the well ran dry. Norway was still a threat in 1220 when Alexander II built the medieval castle as a defence against them and it was only when the Treaty of Perth in 1266 gave Scotland control of the Western Isles that this threat receded. 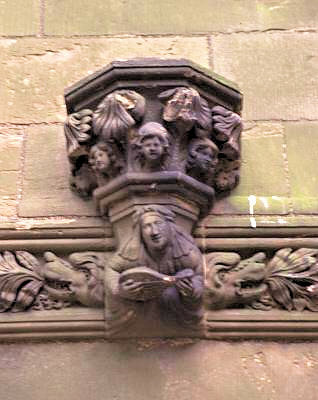 However very little of the medieval structure remains and most of what is visible today dates from the 17th and 18th century. Much further to the south-west, and north of the Solway Firth in Dumfriesshire, Threave Castle is a forbidding tower built on an island in the River Dee, it was long a stronghold of the Douglases after having been built by Archibald Douglas (known as Archibald the Grim) in the 14th century. After their conflicts with James II the castle eventually passed to the Maxwells - the family that Agnes Herries married into - in 1526. 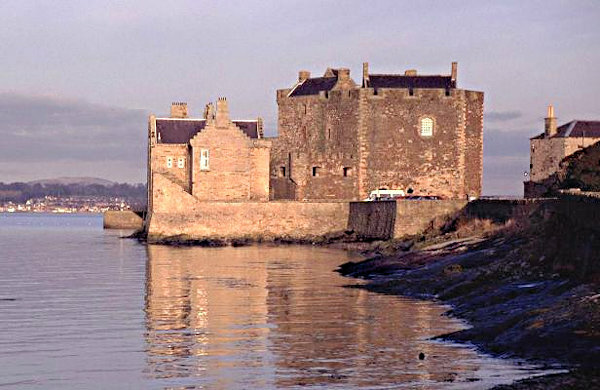 The castle has been extensively preserved and its archaeology investigated, including the medieval riverside harbour.